Surtsey, a volcanic island approximately 32 km from the south coast of Iceland, is a new island formed by volcanic eruptions that took place from 1963 to 1967. It is all the more outstanding for having been protected since its birth, providing the world with a pristine natural laboratory. 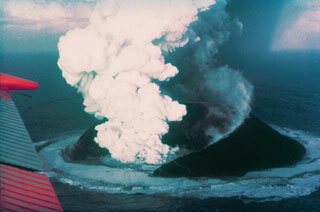 Free from human interference, Surtsey has been producing unique long-term information on the colonisation process of new land by plant and animal life. Since they began studying the island in 1964, scientists have observed the arrival of seeds carried by ocean currents, the appearance of moulds, bacteria and fungi, followed in 1965 by the first vascular plant, of which there were 10 species by the end of the first decade. By 2004, they numbered 60 together with 75 bryophytes, 71 lichens and 24 fungi. Eighty-nine species of birds have been recorded on Surtsey, 57 of which breed elsewhere in Iceland. The 141 ha island is also home to 335 species of invertebrates. This article uses material from UNESCO World Heritage List article "Surtsey", which is released under the Creative Commons Attribution-Share-Alike 3.0 IGO License.